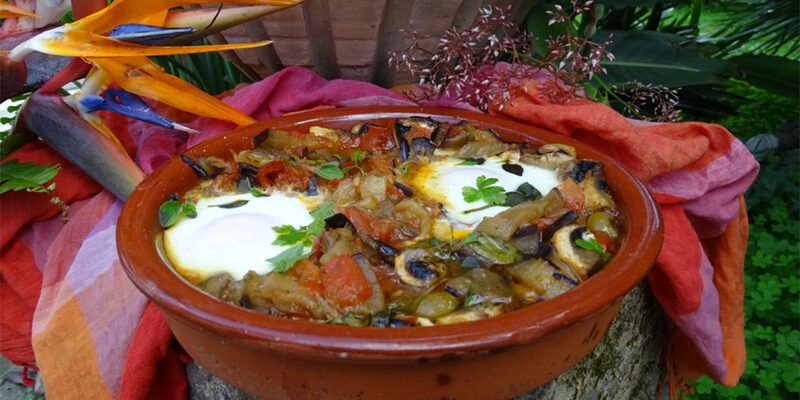 Shakshuka, shakshouka or chakchouka is a North African dish or vegetables and eggs cooked in a tomato sauce. The name is thought to originate from Arabic, meaning a mixture, or from Berber, meaning a vegetable dish. Recipes vary but this version uses eggplant for a lovely, meaty texture and olives and Feta for saltiness. It makes a nutritious, satisfying brunch or lunch dish. This version is made on the stove-top, but the recipe can also be baked in the oven. Make it up till the eggs are placed in the vegetables and then place in a preheated oven at 350°F/180°C for 30 minutes to set the eggs and intensify the vegetable flavors. Heat oil in a large skillet or cast-iron frying pan until very hot. Make 4 hollows in the vegetable mixture. Break an egg into each hollow. Sprinkle with fresh herbs. Serve.